The Mukilteo Lighthouse Park was constructed in the 1950s on a filled tideland and has provided continuous public beach access up to the present. The former Washington State Park was deeded to the City in 2003. In 2004, the City adopted a Lighthouse Park Master Plan to make physical improvements to the approximately 14.4 acre site. Phases I & II of the Plan are completed. This park is also the home of the historic Mukilteo Light Station and is available for touring and special events. 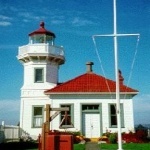 To obtain more information about the Lighthouse, contact the Mukilteo Historical Society or visit their website. There is more information about parking at Lighthouse Park. City Code 9.60.020 specifies when city parks are open and closed. (A) All city parks, except Lighthouse Park, shall be closed from dusk to dawn unless other wise posted by the city of Mukilteo. (B) Lighthouse Park shall be closed between the hours of ten p.m. and six a.m. between October 1st and April 30th and ten p.m. and four a.m. from May 1st through September 30th unless otherwise posted by the city of Mukilteo. A responsible adult shall be present at all times. All fires shall be in designated pits. No beach wood shall be used for fires. No accelerants shall be used to start or maintain fires. Fires shall only be charcoal, clean dry firewood or manufactured fire logs. No treated lumber of any kind is allowed. Fires shall not be higher than two (2) feet. Fires shall not be allowed during air quality burn bans and/or fire safety burn bans. Fires shall be extinguished before leaving. Fires shall be extinguished if deemed unsafe or a nuisance by the Mukilteo Fire Department or Mukilteo Police Department.